My foray into Tokyo fashion has opened up the kimono for more street style photography – but this time for geisha style. 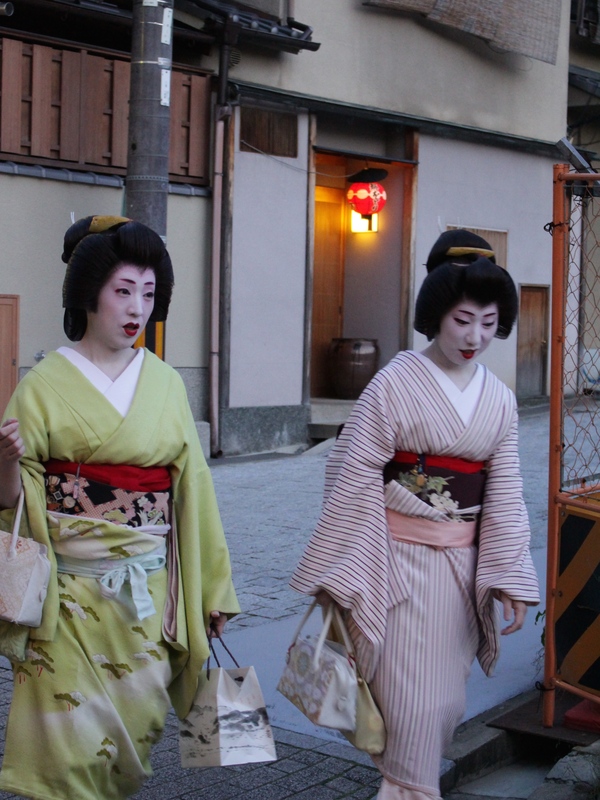 Kyoto’s Gion district is world famous for their geisha (often referred to as geiko in Kyoto). 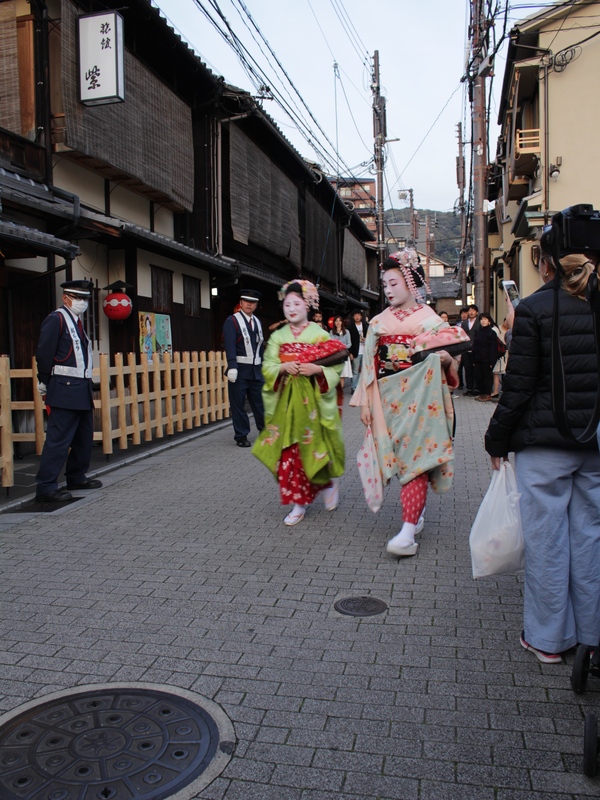 Comprised of alleyways of traditional wooden townhouses, tea houses, restaurants, and bars, it is a place where one feels like they have stepped back into time. It is precisely this charm and slice of the traditional Japanese culture that makes it a main tourist attraction. Prime geisha watching should occur just before 6pm, which is when many of the geisha can be seen in the alleyways, leaving to engage in the evening’s activities. Simon and I had just happened to wrap up our sightseeing for the day, and hopped off at the Gion bus stop to see if we could get lucky with some geisha. We didn’t have to wait long for the first one to appear. 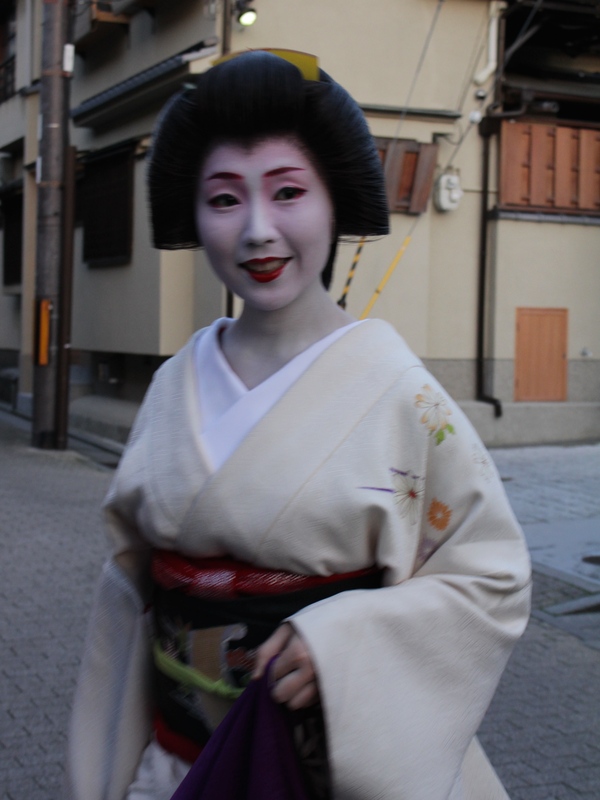 Her hair was perfectly coiffed and face painted in porcelain white, dressed in the most beautifully printed kimono. I had spotted her – but so had a hundred other tourists. Like moths drawn to a flame, they were already fluttering about her, attempting to snap the perfect photo. Oh f-stop – I was a shutter speed too slow, and missed my chance. 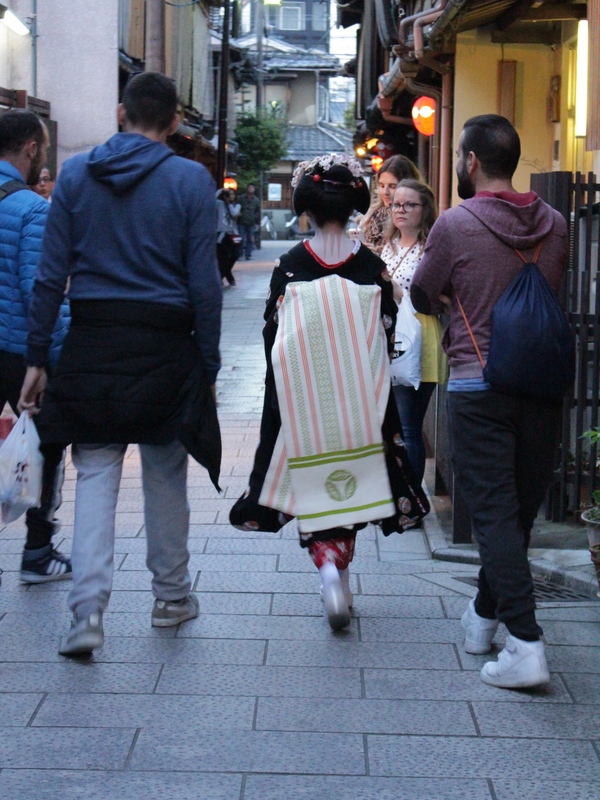 My failed attempts continued with the second, third, and fourth geisha sightings. I was beginning to feel like the victim of orchestrated events, all positioned to prevent me from taking the perfect photo. Imagine a normally busy street suddenly (and rarely) free of traffic and tourists, all conditions for a perfect photo opportunity should a geisha appear. Alas, there she is! At that precise moment, two taxis pull in around the corner unexpectedly. 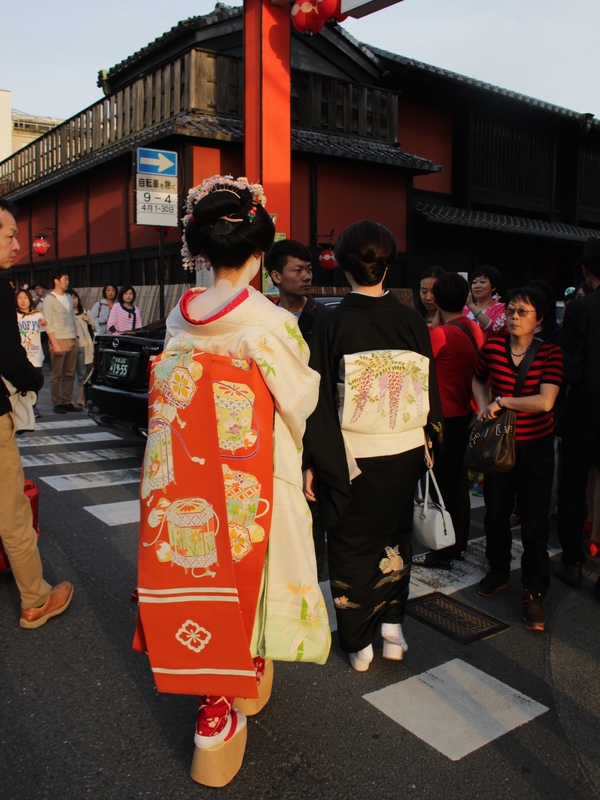 A large crowd of tourists dressed in kimonos, appear out of nowhere and flock all around her, creating a case of Where’s Waldo. Meanwhile, a delivery boy carrying several huge boxes crosses the geisha’s path, blocking the last sight of her before she disappears into a teahouse. I thought this was the kind of stuff that movies were made of, but I can attest that it does happen in real life. All these incidents intercepting my trajectory towards the geisha only fueled my increasing aggression. The paparazzi in me took over, and I had an out of body experience. Like a crazed woman, I pushed people out of my way, dodged in between moving cars, risking my life for that perfect photograph. Excited, I called over to Simon across the street every time I had a sighting. His head was down, playing with his phone, unfazed by the commotion that had just occurred before him. Clearly he was not into the geisha as much as I was. Sensing my frustration, he suggested that we leave the main thoroughfare and try our luck elsewhere. We meandered through the alleyways of red lanterns. It was relatively quiet and seemingly actionless, until we chanced upon a small crowd of people. As we got closer, I thought they were just staring at the eye sore of an empty fenced off lot in front of them. There were two officers in blue uniforms periodically waving their neon orange wands to keep the small crowd on the sidewalk and off the street. Unsure of what they were waiting for, Simon and I halted our pace and stepped in with the crowd. It didn’t take long for us to find out what everyone was waiting for. A geisha appeared coming down the hill, and soon, several more. Unlike my experience on the main street, there was no aggressive paparazzi style tactics. The crowd snapped photos with a respectable distance. 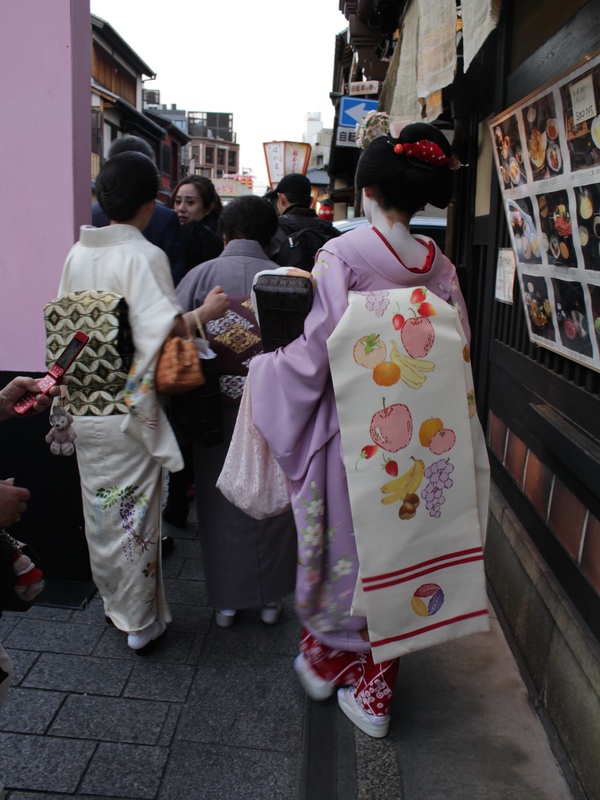 This calm environment allowed us to fully appreciate the beauty of the geisha as they glided past us, the clacking of their wooden thong sandals echoing through the alleyway. I could’ve waited there forever, but the sunset sky quickly turned dark. Running high on pure adrenaline and excitement from chasing geishas, I didn’t realize I was neglecting my basic needs for survival until Simon pleadingly asked, “Can we eat now?” I then realized the growling of my own tummy and the cotton ball dryness in my mouth. I’m not completely satisfied with my blurry photos, but I suppose that is the essence of paparazzi style photography. I would’ve done the paparazzi sprint and shove with you!! The pictures are fabulous. Are the two girls in the top picture (in the calm street) running? Hope your travels are still going well and that it is everything you hoped it to be. Miss you! I looked like a crazy lady, Simon can attest to that! None of them were running; on the contrary, they just walked very fast at best and remained very poised despite the aggressive tactics. Miss you too.